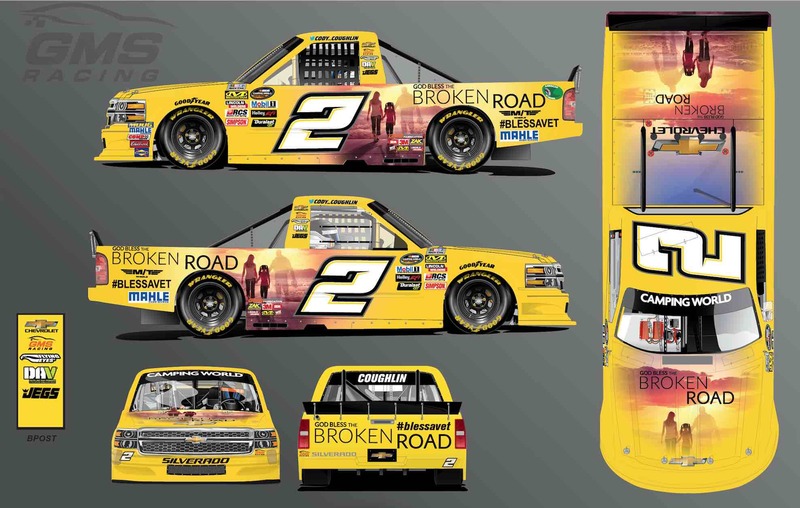 Heading to Las Vegas Motor Speedway (LVMS) for the second time during the 2018 NASCAR Camping World Truck Series (NCWTS) season, Cody Coughlin is confident that his return trip to the “City of Lights” will result in another successful night of racing to add to what is already a career-best NCWTS season. After qualifying in the top-15 at LVMS earlier in the spring, Coughlin raced his way into the top-three running order and remained in the top-five through the final portion of the race. An untimely caution during green flag pit stops however thwarted his strategy, but Coughlin was able to power his way back to the front, capturing an eighth-place finish. Aside from the event in March, Coughlin has two other NCWTS starts at the 1.5-mile oval which include qualifying efforts within the top-15 for both races, as well as a sixth-place finish last fall. Confident in the Chevy Silverado that his team has prepared for him for this weekend’s race, Coughlin’s No. 2 will unload at LVMS with a new look. Coughlin will proudly climb behind the wheel of his Chevy, wrapped in the movie poster for God Bless the Broken Road, which opened in theaters last Friday, September 7th. Making a featured cameo in the movie, Coughlin starred alongside stars such as Jordin Sparks, Lindsey Pulsipher, Andrew Walker, LaDanian “LT” Tomlinson and others. Combining faith and stock car racing, God Bless the Broken Road shows strong support to those serving in the military and what they and their families endure, with a portion of the movie profits being donated to the Disabled American Veterans (DAV). Co-director Edgar Stoble and producer Andy Fraser from God Bless the Broken Road were both fortunate and kind enough to be able to attend races during the 2018 NCWTS season in support of Coughlin’s racing, as well as be able to spread the word about the movie and great causes they are associated with. Earlier this year, Coughlin was named an ambassador of DAV, a nonprofit organization that provides support for America’s ill and injured veterans. Privileged to be named a DAV ambassador and to be a part of such an honorable cause, Coughlin’s support of the charity includes the #BlessAVet campaign, an initiative created by DAV in conjunction with Fandango. Also featured on Coughlin’s No. 2 Silverado this weekend at LVMS is the #BlessAVet campaign. With this project, people can send a veteran to dinner with a $25 Restaurant.com gift card as well as a movie ticket to see God Bless the Broken Road while it is in theaters. Tune into the World of Westgate 200 at Las Vegas Motor Speedway on Friday, September 14th at 9:00 p.m. ET on FS1 to see Coughlin’s No. 2 God Bless the Broken Road Chevy on-track, or you can listen along to the race broadcast on either the Motor Racing Network (MRN) or SiriusXM.